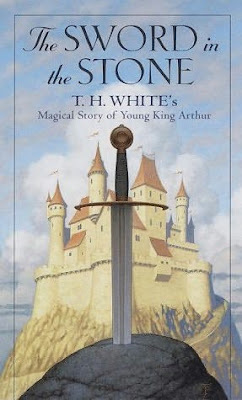 The Once and Future King (published before White's death) was adapted into the Disney movie The Sword in the Stone as well as the Broadway musical, Camelot (which was then, of course, turned into a movie by the same name . White lived both to the see the Broadway adaptation as well as Disney's interpretation of his works. If you've not read T.H. White before (as I had not prior to this book) I think you might be charmed by his writing style. He has a very P.G. Wodehouse feel about him. There are several passages that made me grin and snicker outloud. He is very engaging and witty and I thought also of Whitehouse and The Strictest School in the World series. (Bet you wondered how I was going to manage to mention that series again, eh?) I was highly entertained from the standpoint of humor. There is a young boy who goes by the name of Wart who friends a magician by the name of Merlyn. Wart is being raised by a guardian, Sir Ector, who has a son by the name of Kay. Because Wart's blood is of no distinction, he has no hopes of being able to become a knight. Kay, on the other hand, will receive such honors and will become master of his father's estate. Sir Ector does feel the need to have both boys properly educated and finds himself in want of a tutor. One day Kay decides to go out hawking and Wart comes along with him. Their hawk gets away from them and Wart goes off in search of the bird in the mysterious woods. He happens upon Merlyn, who is expecting him, because Merlyn lives backwards in time instead of forward, like the rest of humanity. Merlyn sets himself out as the boy's tutor and returns to Sir Ector's castle with young Wart. Merlyn's purpose, of course, is to educate Wart for eventual kingship, although this is not revealed until the very end of the book. Part of Wart's education comes from being magically turned into things such as a fish, a snake, and an owl. Each lesson supposedly teaches Wart something about himself and how to rule his future kingdom. There is a great deal of magic in the book. Merlyn professes himself to be a practitioner of white magic and his abilities are compared in contrast to Madam Mim who practices black magic and who engages Merlyn in a wizard's duel at one point in the book. Merlyn himself is kind of an absent-minded fellow who can't tell if he is coming or going (since he lives backwards in time) and provides a great deal of comedic relief throughout the book. I've mentioned in the past that I am working on formulating an opinion as to when I think magic is used well in books and when it is not. As for this read, I'm not going to comment on that or form an exact opinion. This book read as more of a historical comedy to me than anything else. It's feel was just very light hearted and so I never experienced any real cause for alarm, other than the wizard's duel against Madam Mim who was most definitely a creepy character. Her chapter was short-lived though for which I was grateful - and Merlyn was clearly the victor in their battle. Wart is bored and comes to Merlyn asking to be changed into a hawk so as to have an adventure. Meryln hushes him, being busy knitting, and Wart takes a seat. After several minutes he said, "Is one allowed to speak as a human being, or does the thing about being seen and not heard have to apply?" "That's good, because I wanted to mention that you have been knitting your beard into that night-cap for three rows now." "I should think the best thing would be to cut off the end of your beard. Shall I fetch some scissors?" That's where the eclairs stay." This book is just so oddly amusing and very unique. Definitely a boy's tale, I should think. (Although this girl enjoy it quite well herself.) White clearly had a worldview to espouse in this book and I did not agree with all of it. There is plenty of mention of the earth being millions of years old, for instance, and apparently he wrote The Once and Future King to explain his idea of an ideal society. He was definitely a political writer as well as a humorist, but the parts I did not agree with were easy enough for me to ignore. As for the Disney version of The Sword in the Stone . . .
That said, I greatly disliked Madam Mim - just as much as I disliked her in the book. She is a scary character and any child sensitive to characters who change themselves at whim into scary looking animals should not have this film inflicted upon them. Bookworm1 is particularly sensitive to "scary things" and there is no way I would show him this film. So no, we will NOT be adding this one to our Disney library. Although Disney tried to lessen her scary impact by making her the color pink (as well as making all of the animals she was turning herself into pink) her intent towards Merlyn was evil and that was very clear. When she turns her face into a pig's face it's quite grotesque and then, of course, ultimately she becomes a dragon which Disney has a way of making kinda scary when you are talking about the villain. No, we will not be watching it. The movie version was also too short and, I thought, lacked in substance compared to the book. They lacked the time to truly dive into the story and give a deeper understanding of who Wart was and why his education was so amazing. For example, in the movie Wart introduces himself to Merlyn as "Arthur, but everyone calls me Wart." Disney had to cut to the chase and so lost the depth of White's original story and made the film kind of fall flat for me. Sometimes I really like the Disney-fied versions better and think they are an excellent way for children to learn to engage with stories. (For example, we've recently been enjoying Disney's The Jungle Book and Bookworm1 even expressed an interest in reading the original stories - even thought it's a dreaded chapter book! In the case of The Sword in the Stone, if we indulge ourselves in this tale I would far rather my boys not be familiar with the movie and hold off on reading this book until their imaginations can capture the adventure and the magic of it as a stand-alone. As for myself, I'm glad to have read the (1939) book and I'll stick it up on our bookshelves for later. As for the movie - it went right back to Netflix and I don't feel the need to see it again. This was one of my favorite movies growing up, and now I am really anxious to read the book! Great review! One of my favorite reads. I've read the whole series but this first book is my favorite. I loved Merlin's idea of education. :-) Glad you liked it! The movie is a different animal, but my girls like it anyway. I think Bill Peet is one of the animators. I have never read the book or seen the movie. I'll have to keep this in mind for my nephews when they get older. We do have the movie...never read the book. I've wondered about this book and film but had never delved into either of them. I LOVED that old version of Camelot (I hear, sadly, they're making a new sexed-up version. Sigh!) I picked up The Once and Future King once, but it didn't look appealing just by glancing through it. When my kids were small, I didn't allow any stories or movies with magic (didn't want to confuse the issue), but as they got older I came to the conclusion that wizards like Gandalf are not the same as wizards in real life, so fairy-tale magic may be okay. By the time we began to allow a little of that kind of thing, they were old enough to understand the difference. I finally decided on "Pinnochio" and "Tangled". "Tangled" is more for me than it is for him! Ronan is enjoying The World of Pooh right now, which is a chapter book. Joshua might like it too. We don't normally read chapter books, this one just happens to fit us. Okay, that seals it. I am going to do a Strictest School read-aloud with Amanda. I told you she never really got into the first one, but she was younger. I think it will take this time! We both love MBS, and I've been wanting to do another read-aloud, so I'm going to start!! 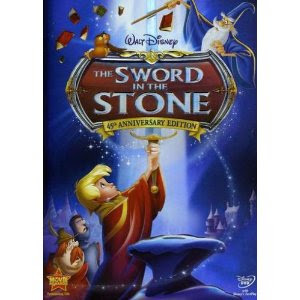 My kids and I loved the Sword in the Stone movie. I didn't realize there was a book series behind it. My youngest son is at a perfect age for reading this and I know I'd enjoy it too. Thanks for the heads up and great revew! sorry - meant to type - review. I didn't look appealing just by glancing through it.